SAFE WITH PREMIUM QUALITY: The Muffin Pans are made by food grade silicone which are approved by FDA. 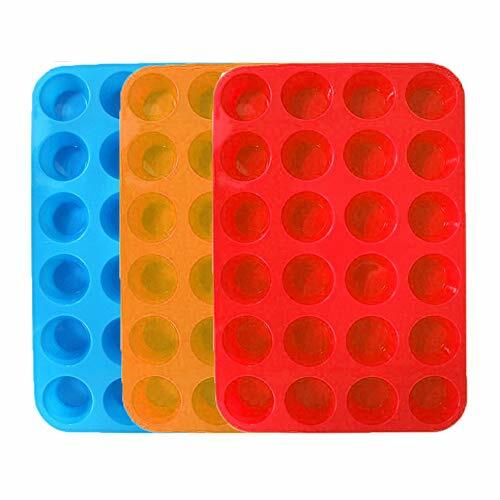 SAVE MONEY FOR YOU：You will get 3 VALUABLE bright color ( Orange, Red, Blue ) 24-Cup Silicone Muffin Pans. WIDE APPLICATIONS: Great for DIY baking muffins, cupcakes, candies, ice cubes and more other home creations. Develop your kids'hands-on skills and imagination, share DIY fun with your family. EASY TO USE & CLEAN: Fits for most ovens, can be placed on the baking sheet or directly in the oven. Cleaning mini muffin pan quick and easy. DISHWASH SAFE & BPA FREE: Made from high quality food grade silicone. Free of Phthalate, PVC and other toxic materials, make safe food as you want. If you have any questions about this product by WedFeir, contact us by completing and submitting the form below. If you are looking for a specif part number, please include it with your message.